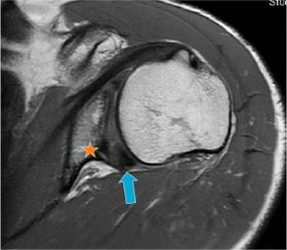 While primary glenoid dysplasia is a rare developmental abnormality of the shoulder, the term glenoid dysplasia refers to malformations in the lower rim of the glenoid, the “socket” of the shoulder. 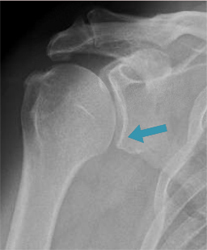 Glenoid Dysplasia: Severe abnormalities and bone loss on the backpart of thelower rim (“posteroinferior” rim) of the shoulder’s socket, or glenoid, are clearly visible on an X-ray as indicated by the blue arrow on the right-most image. 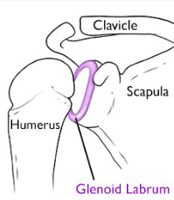 Glenoid retroversion: the orientation of the surface of the glenoid, or the socket, relative to the plane of the scapular body, or shoulder blade. When the angle between these two planes differs greatly from the normal perpendicular orientation, this is thought to be a risk factor for posterior instability, or instability in the back of the shoulder. The CT scan to the right demonstrates a coronal view of the shoulder (with the ball on the left and the socket on the right). 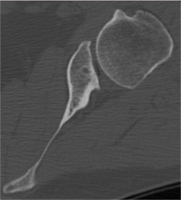 The image to the right shows approximately 45 degrees of glenoid retroversion. Posterior instability, or instability in the back of the shoulder, is a symptom of glenoid dysplasia and can be identified through physical examination. However, patients with glenoid dysplasia without arthritis do not always present the same symptoms, and younger, adolescent patients do not usually have many symptoms of dysplasia in physical examinations. Symptoms may develop over time due to wear or through increase in physical activity through sports or occupation. 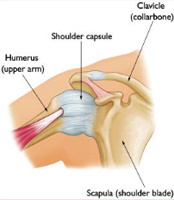 Glenoid dysplasia can be diagnosed through imaging which may depict the malformation of the shoulder socket. 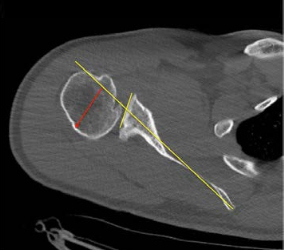 CT scan showing glenoid dysplasia and slight dislocation, or subluxation, of the back part of the ball of the shoulder joint (posterior humeral head). Yellow lines indicate glenoid. 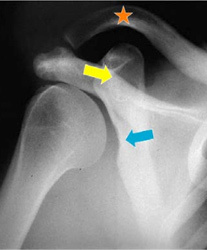 The red arrow indicates the partial dislocation of the humeral head. 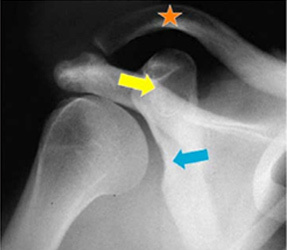 MRI scan showing glenoid dysplasia with combined lesions of an enlarged posterior aspect of the labrum (blue arrow) which lines the rim of the glenoid, glenoid retroversion, posterior humeral head subluxation, and bone deficiency or hypoplasia in the postero-inferior glenoid (orange star). 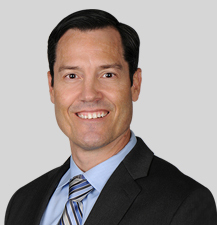 For asymptomatic patients, physical therapy to strengthen the rotator cuff can help some patients avoid surgery, but often is insufficient in alleviating all instability or in helping patients to return to physically demanding work or sports. For symptomatic patients, exercises focusing on external rotation stretching and internal rotation contracture may help. 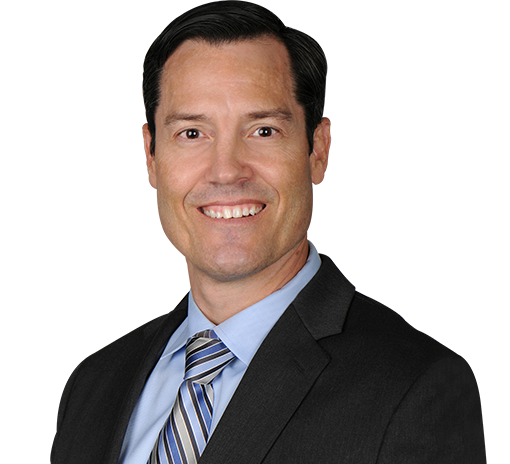 Glenoid augmentation procedures: bone grafts from a variety of sources (acromion of the clavicle, iliac crest of the pelvis, tibia in the leg, or the ribs) placed within or just outside of the shoulder capsule. Incongruent or lateralized augmentation: the graft (usually a tibial allograft) may be placed in a lateralized position where it “blocks” the humeral head from moving too far towards the back of the shoulder. Shoulder X-Ray demonstrating the lateralized posterior bone-grafting technique. Theblock is indicated with the dashed red arrow on the image on the left. On the right: axillary view of graft with screw.